Those who follow my blog know I like to try new places to eat, especially if they have good comfort food. “Seafood” is not my go to kind of fare, but when I am part of a group who wished to explore a restaurant in Port aux Basques, I was up for it. Only minutes from our hotel we traveled to Margaree, a quaint little town on the south west coast of our beautiful island. As we entered this establishment we were greeted with smiling faces and what I would describe as real “Newfie Music” (and I mean this affectionately) . it helped set the tone to catch up with old friends and make new ones at the Economic Developers Association of Newfoundland and Labrador annual conference and AGM. Collectively, our jaws dropped as we witnessed the amount of food on each plate as it was presented to the other tables in the restaurant. It looked like something that would of came from Food Networks “Diners, Drive In’s and Dives”. We all knew what we were in for and made our decisions, below are some of the pictures (so you will believe me, they were huge portions!!) as well as some of my comments on the flavors and presentation. 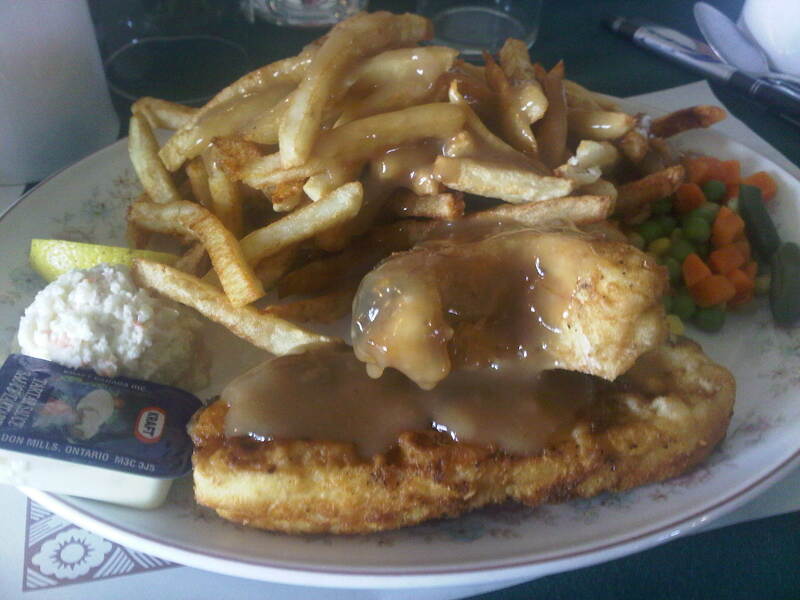 Fish n Chips and gravy, classic, it is one meal we are known for, it was a generous portion for Todd Mercer of Grand Falls – Winsor. I do like halibut, especially if it is prepared correctly, I like a light crust, a firm texture with no over powering elements, Seashore restaurant delivered big time, those who ordered it were impressed. Before I order I usually ask some questions, is it fresh? How to you prepare it? Do you make your gravy from scratch? Well most times those questions pay off, as there are no hidden surprises, especially if the restaurant can deliver. My payoff is what I asked about the gravy, I like home-style, like I would make. Although the main house gravy was a powered mix, I was soon to learn that they had turkey gravy!! I was quick to add this to my order; it was made from the turkey drippings and had a rich flavor that complimented the halibut. 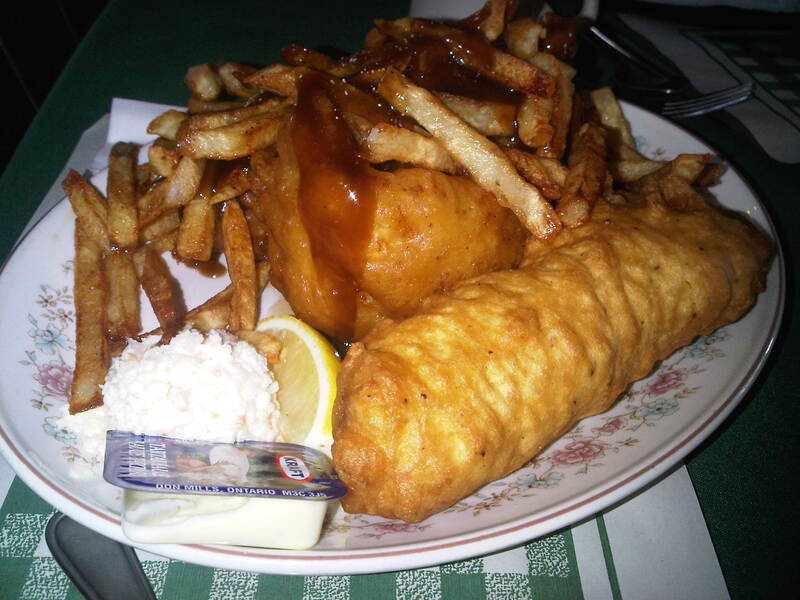 Halibut , fries with turkey gravy, yummy!!!! 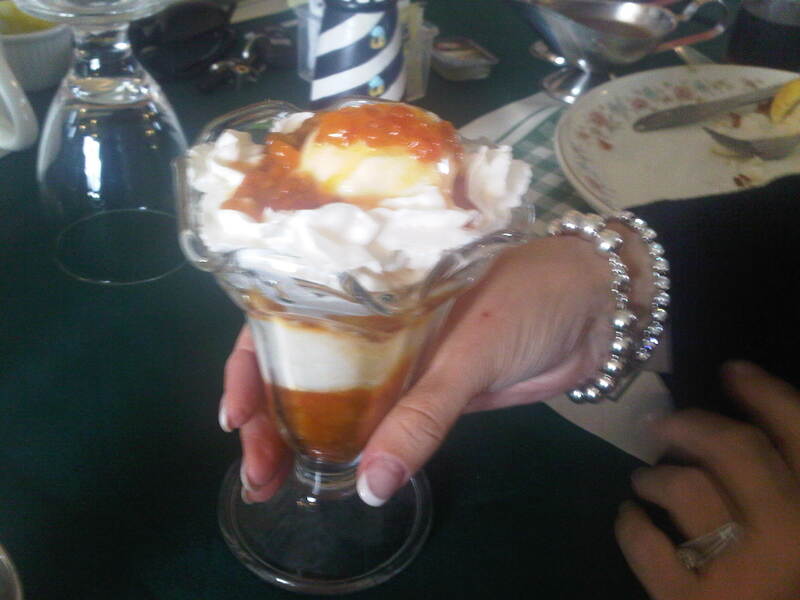 Although I seldom order desserts, some at our table did indulge , the one pictured below is a bake apple sundae, it looked great and by the smiles on the faces of those who had a taste is was wonderful. I like to order an appetizer; most on the menu were home-made, with the exception of the Onion Rings. It would be my recommendation that home-made onion rings would be a hit for visitors and locals. When visiting this amazing part of Newfoundland and Labrador, you need to check out Seashore Restaurant, I will be back. Thanks to Mayor Brian Button and his staff for their hospitality during our visit to Port Aux Basques.